You’ve probably used Twitter as a professional networking and marketing tool. But you may wonder whether Twitter actually leads to more sales. It turns out a recent survey by Market Probe International answers that question. Conducted on behalf of Twitter, the research firm surveyed 500 people over the age of 18 in the US and the UK who regularly follow small to medium sized businesses on Twitter. Results were published on the official Twitter advertising blog today. The upshot of the survey is that Twitter can have an impact on small businesses — and that getting Twitter followers matters. And in fact, Twitter set up the hashtag #FollowersMatter, to emphasize those results. The survey shows Twitter can influence purchase decisions. According to the survey, 72 percent of those who follow a business are more likely to make a purchase afterward from that business. If that holds true across the board, that means your followers are likely to turn into paying customers, if they are not already. Not only that, but 82 percent of followers are more likely to recommend your product or service to friends and family. That means, Twitter has a positive impact on and can amplify word of mouth. Twitter can lead to more loyal customers. For instance, 85 percent say they feel a closer connection to the SMB after they follow them. The majority of those responding, 73 percent, said they followed SMB brands on Twitter primarily to get updates on a company’s future products. Based on that,you should be tweeting about new product launches, executive presentations (that are public) discussing the company’s future direction, special offers to try new products, and similar information. 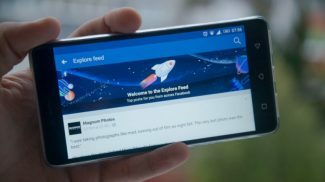 63 percent said they followed brands primarily to show their support. When you think about that, it’s important for small businesses to get support. Small businesses don’t have the same resources for market research as large corporations, and don’t always know if they are hitting the mark with customers and potential customers — or what they may need to change. Customers want to interact and engage with small businesses. 61 percent of those surveyed said they followed businesses not to receive information but to give feedback and communicate. Twitter has a small business handle at @TwitterSmallBiz to follow. For more information about using Twitter for small business read more Twitter tips and advice from Small Business Trends. Could I clarify, please: the 72% – they were found to be more likely to buy from a small business they follow via Twitter – but compared to which platform? Because without that comparison, who is to say there isn’t a higher or similar conversion rate on a different platform (FB, LinkedIn, for instance). Well, yes, you’re right. But the thing is that, to my knowledge, those numbers haven’t been widely publicized by the other sites, or not in an easily comparable way. For a while now, some small business owners have been convinced there is no measurable ROI to using social media at all. Especially not in terms of actual customer acquisition or sales. So, from that standpoint, having numbers like this is actually pretty impressive. I agree, Shawn. It’s extremely impressive. Encouraging too. One could focus their efforts accordingly, on that one platform, based on those findings, I guess. I was just curious to know how it fares with the other ones. Maybe it’ll be available in the future. I think you can actually get some sales if the followers are targeted. This means that you did not resort to spammy methods just to get your followers. They must be following you primarily to get updates. If this qualification is satisfied, then you’ll surely get some sales. People need to keep an eye on Twitter to check on what’s bubbling and SMBs are tweeting their updates to get more followers which might eventually turn to sales. 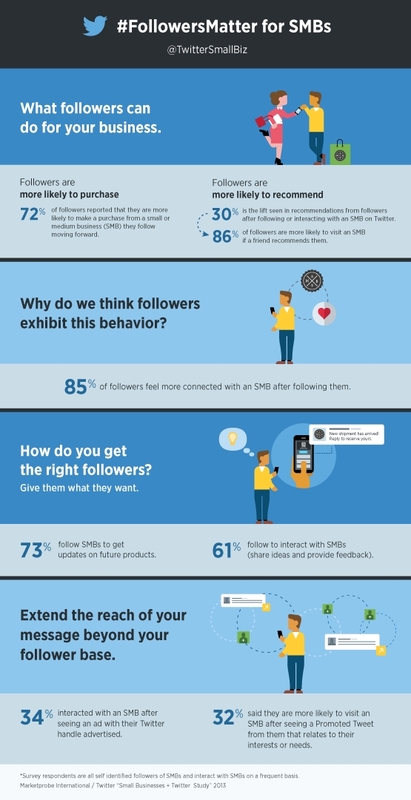 Good infographic on #FollowersMatter for SMBs. This could be said for any star on Twitter. I think a lot of people get Twitter accounts, follow people, but then realize what a giant waste of time it is and never log back on. Great infographic. Many small businesses do use Twitter to gather a faithful fan base. But, how much they actually increase their sales, thanks to Twitter, remains to be seen, I guess. Shawn: As a fan of Twitter, I am glad to hear about the survey. I am wondering if Twitter has become much more mainstream by customers in the US and the UK, compared with other countries. Is the open communication style the biggest advantage compared with other social media tools? This year made by MPI couldn’t come any better for us as we were just debating upon whether we should be more active on Twitter to our customers and if so, how. Now, the first question of ours has been answered (in the affirmative) while the second question requires more research. However, the tips above should prove to be quite useful. Thank you for a great infographic. I have found this to be true for our business, as on Twitter potential customers have a chance to engage and get to know business owners, and also they are able to carry out pre-purchase research very easily, so that when it comes to sourcing a supplier they already have you in their consciousness.